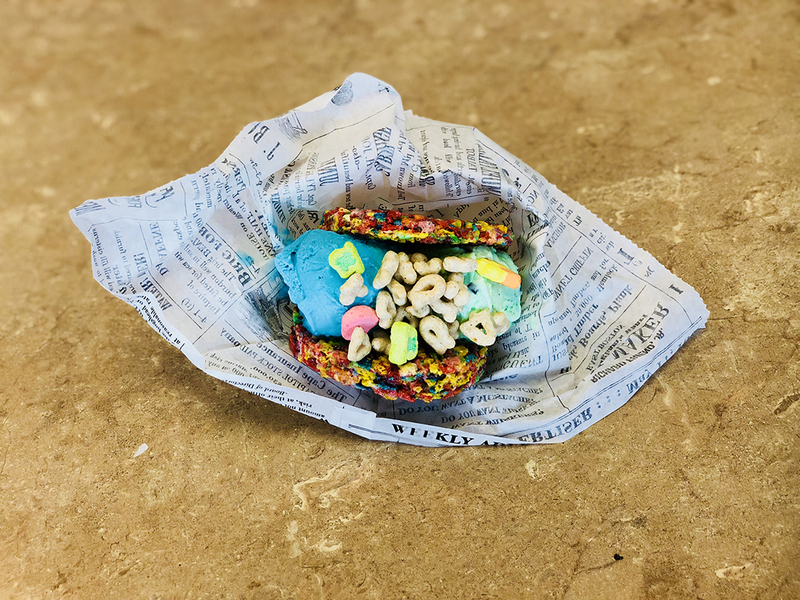 TeeJay’s Sweet Tooth makes homemade Rice Krispy treats with Fruity Pebbles cereal to use for ice cream sandwiches. Where to go: TeeJay’s Sweet Tooth, 8660 Purdue Rd., Suite 8666-600, Indianapolis. 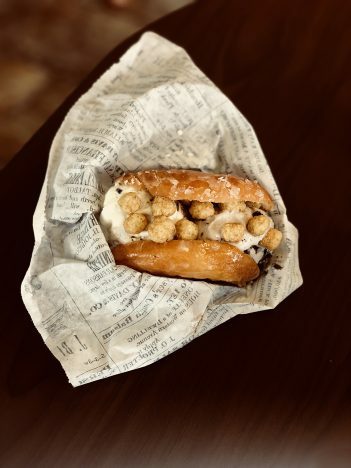 What to get: Donut Ice Cream Sandwich. Anna’s take: TeeJay’s Sweet Tooth has only been open a month and already customers are photographing the vibrantly colorful ice cream sandwiches and posting them on social media. According to TeeJay’s, the ice cream shop is home to what it calls the only donut ice cream sandwich in Indiana. The sandwich is a sight to behold. Customers can choose two scoops out of 16 flavors to sandwich between two halves of a Jack’s glazed donut and top it with one topping. I ordered the cookie dough ice cream and the cookies and cream ice cream with a donut sandwich and topped it with peanut butter crunch cereal. When assembled, the donut-ice cream concoction is heated in a waffle iron-type devide for five seconds, which is enough to warm the donut but not melt the ice cream. The mix of flavors and textures from the flaky, sweetened donut glaze to the crunch of the cereal and smoothness of the ice cream tastse heavenly. The delicious behemoth was only $5. The shop offers more than donut sandwiches. I couldn’t help but sample the Fruity Pebbles Rice Krispy sandwich with Blue’s Vanilla and Mint Chocolate Chip ice cream topped with Lucky Charms cereal. It was a delicious, colorful snack. I also tried a scoop each of the Lemoreo (lemon Oreo) and the Graham Central Station flavors, which are the store’s most popular flavors. TeeJay’s is affordable, and it sources its ice cream from Sundae’s Homemade Ice Cream in Indianapolis. The concoctions are dessert monsters you’d expect to find at a State Fair, and they are worth breaking a diet for. In addition to ice cream sandwiches, TeeJay’s sells cones, scoops and floats. Fall flavors will be available soon.